Do you have a family? I begot upon the daughter of a poor man and a goddess a son named Sarruma, through whom I will avenge myself upon the dragon Illuyankas. And also I begat a daughter, to help me lay low this dragon and stop him and his family from eating Hattian children. What is the best way to kill a dragon? To kill such a dragon, even a god must go carefully. I will smite him with my lightnings, and overcome him with my lightnings. I will strike the sea, and it will arise to my purpose. I will summon the storms, and they will come to aid me. When he is weak I will pierce his eyes with my trident. I will make the sea boil with my wrath, and the dragon will die of my rage. To be a god, one must be a hero. One must heed the peoples of the lands, and bring good things upon them. I bring the thunder, the lightnings, the rain to nourish beasts and crops. I fight beside my people when they war, striking down their enemies and even their gods. I summon the rain and the wind and all weather. In the Hatti lands, where we have 1,000 gods, I rule them all. For the sake of my peoples, I call the other gods to aid me and together we fight great battles. How much research did you need for your story? My wife, Janet Morris, and I have spent many years reading and researching Ancient Near Eastern myth and legend, some of mankind’s earliest stories. But researching in detail the myth of Illuyankas required not only a deep familiarity with the various versions of the story, but enough command of the early texts to be able to create a single version out of several. Have you written for anthologies before? How does it differ from writing a novel? I have written for a number of shared universes, including Janet Morris’ Heroes in Hell universe, Bob Asprin and Lynn Abbey’s Thieves’ world universe, C.J. Cherryh’s Merovingen Universe, and more. I actually enjoy the challenges of working in a shared cosmos. I’ve also written stand-alone short stories, another different form. A novel allows you time to work with more layers of story than does a short story, in which space is very limited. In a short story, you must know everything about the “past” of the characters, but not tell all, only the climax. So compression of the most radical sort is needed for a short piece of fiction which must have a beginning, middle, and end in a confined space. What other novels/short stories have you written? With Janet Morris, I have written a number of novels: The Sacred Band is my favorite, with its grand canvas and heroic ethos. I have also co-written The Fish, the Fighters and the Song-girl, Outpassage, The 40-Minute War, Threshold, Trust Territory, The Stalk, The Little Helliad, M.E.D.U.S.A, and other novels, including several by pseudonyms. Tell us one unusual fact about yourself. Recently, I came to the craft of narration, and found that it allows me to mix my musical, technical, and prose skills in a new and most satisfying way. I have just finished narrating The Sacred Band for Perseid Press, available on Audible.com, and am just in the final stages of producing I, the Sun for Perseid Press, which will be released on Audible.com for Perseid Press. 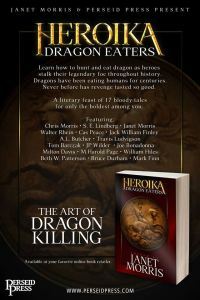 Chris Morris’ wonderful comments on Heroika 1: Dragon Eaters….